On this page we will be recording instances of ‘rollback’, ie retreat from the human rights and equality standards as set out in the Belfast or Good Friday Agreement. This follows on from the CAJ conference on Mapping the Rollback, organised in cooperation with the Human Rights Centre (QUB) and the Transitional Justice Institute (Ulster). 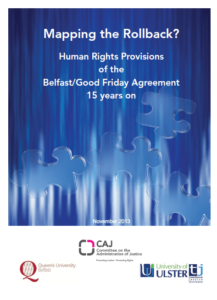 ‘Mapping the Rollback – Human Rights Provisions of the Belfast / Good Friday Agreement 15 Years On’.